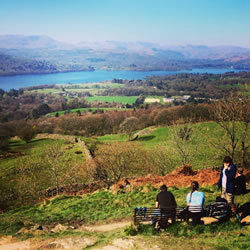 Discover the best places to go, what to do and where to dine whilst in Windermere. Windermere is located just 20 minutes walk from Craig Manor. Here you will find an abundance of great cafes, independent shops and bars. WALK: Orrest Head is located at the top of Windermere and offers spectacular panoramic views over Lake Windermere, The Langdales and Troutbeck valley. It was the first fell climbed by Alfred Wainwright, sparking his passion for walking in the Lake District. CAFE: You will be spoilt for choice when it comes to the cafes in Windermere. For brunch we would certainly recommend Homeground, their platters and coffee are the perfect start to the day! At night, Cafe Italia is popular with its outdoor heaters and prime location. BAR/ PUB: There are many great bars and pubs in Windermere but if you are looking for something unique why not try The Crafty Baa? The quirky interior makes this place one of a kind and the friendly staff will advise you on the best drink for you, with over 100 craft beers and fine wines to choose from. SHOP: Lakeland is the home of quality kitchenware. At their flagship store in Windermere you can see live demonstrations and get hands on with the latest technology.